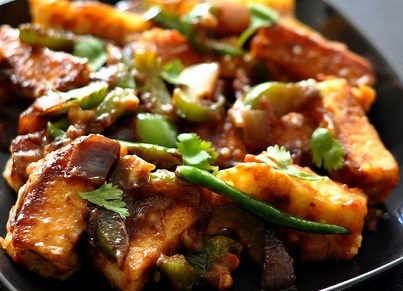 Chilli Paneer: Chilli Paneer is a mixture of Chinese and Indian Cuisine. It is tasty and easy to make as well. and its tangy taste gives a different touch to your food as well. Hope you will like it. Mix the cornflour in half a cup of water. Stir-fry for about half a minute. Add in the capsicum, onion and green chillies into the pan. season with salt and soy sauce. Cook for about half minute. Add in the cornflour mixture. Cook on high heat, stirring continuously, till the sauce thickens and coats the paneer and vegetables. If you have any queries regarding the Chilli Paneer recipe, please leave a comment.